This Ring Lite for close-up and macro shooting is loaded with features and capabilities. 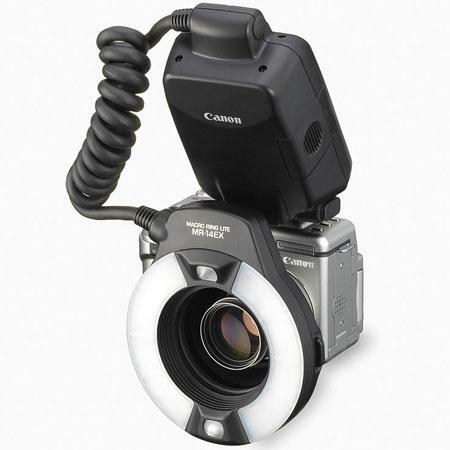 Now with Canon’s E-TTL, it takes full advantage of the flash performance of the EOS-1v, EOS-3, and other E-TTL cameras. 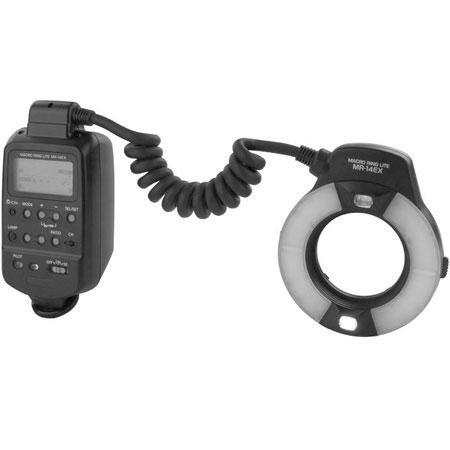 Circular twin flash tubes can fire at even power, or varied between them over a six-stop range, and one or more 550EX Speedlites can be used as wireless slaves along with the MR-14EX. The controller unit now has an illuminated full-info LCD panel and its accepts optional hi-capacity battery packs. Professional close-up flash photography becomes as easy as normal AE shooting when the MR-14EX is mounted onto any EOS system camera that supports E-TTL metering (i.e., Type-A EOS cameras). The E-TTL system emits the perfect amount of light, optimally balancing flash output and ambient light to ensure a natural balance. The MR-14EX also has advanced features such as High-Speed Sync (FP flash), Flash Exposure Lock (FEL), a Flash Exposure Compensation (up to +/- 3 stops) and Flash Exposure Bracketing (FEB, up to +/- 3 stops in 1/3-stop or 1/2-stop increments). When the MR-14EX is used with a Type-B EOS camera that does not support E-TTL autoflash control (e.g., EOS 1N, 5, 10), TTL autoflash control is used. In this case, Flash Exposure Compensation, FEB and manual flash exposure controls are available. Optional : External battery packs Compact Battery Pack CP-E2, Transistor Pack E.
Special Features & Notes Control in E-TTL Mode: FP sync, FE Lock, Flash +/- compensation, Flash Exposure Bracketing. Custom Functions: Seven on the MR-14EX (in addition to any in camera), set on flash LCD.